The Malaga Area Metropolitan Transport Consortium was set up on the 18th of September 2003 as an associative Public Law Body comprising the Andalusian Regional Government, Malaga Provincial Council and the local councils of Malaga, Mijas, Benalmadena, Rincon de la Victoria, Alhaurin de la Torre, Alhaurin el Grande, Cartama, Pizarra, Almogia, Colmenar, Casabermeja and Totalan. The initial aim of the Consortium is to establish economic, technical and administrative cooperation among the member authorities, thus enabling them to fulfil their responsibilities in terms of the creation and management of transport infrastructure and services in their respective areas in a collective and coordinated manner. The establishment of a simple, user-friendly fare system that is based on the number of zones of the Malaga area crossed during the journey and minimises costs for the passenger. This fare system has been adopted by local and long-distance bus services alike and will subsequently be extended to cover all modes of collective public transport in the Malaga area. The introduction of a single integrated metropolitan public transport system. To this end, the existing service is currently being reviewed with the aim of improving it and establishing a quality transport network. The promotion of public transport through the provision of clear information that will convince users of its viability as a quality alternative to private vehicles. The Consortium’s membership currently comprises the Andalusian Regional Government (45%), Málaga Provincial Council (5%) and the aforementioned local councils in proportion to their respective populations (50%). 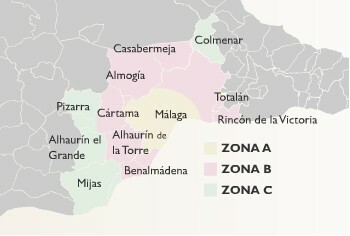 The Malaga Area Metropolitan Transport Consortium consists of the following municipalities: Málaga, Mijas, Torremolinos, Benalmádena, Rincón de la Victoria, Alhaurín de la Torre, Cártama, Alhaurín el Grande, Pizarra, Almogía, Colmenar, Casabermeja and Totalán. The Transport Consortium has extended its area of influence to include the town of Alora through the signing of a collaborative agreement with the Andalusian Regional Government’s Public Works and Transport Department for the Promotion and Improvement of Scheduled Road-Based Public Passenger Transport Services for General Usage in Non-Metropolitan Areas. The proposal to draft and give initial approval to the Metropolitan Transport Plan. The proposal of modifications that do not require the revision of the Metropolitan Transport Plan. Participation in the drafting of both the Metropolitan Transport Plan itself and any modifications or revisions to which it may be subjected. The regulation, coordination, monitoring, inspection and sanctioning of all services, traffic, infrastructure and facilities deemed to be of metropolitan interest, with the exception of those outlined in paragraph two of article 13.3 of the law regulating Urban and Metropolitan Passenger Transport in Andalusia. The regulation and coordination of other forms of transport operating in the metropolitan area that are not included in the previous section, in accordance with the terms established by the Metropolitan Transport Plan. Management of the Metropolitan Transport Plan. The establishment of the fare system for the services provided within the geographical areas covered by the Consortium. The promotion of a collective image for the transport system in the Malaga Area. The promotion of public transport. The establishment of the fees to be received by the transport companies in accordance with the criteria set out in the Metropolitan Transport Plan and the demands made by their public service obligations. The allocation of the grants or subsidies received from the various member authorities, in accordance with both the conditions of the Metropolitan Transport Plan and those of any framework contracts that may be agreed in this respect with the transport companies themselves. Establish the mechanisms required to introduce an integrated fare system for scheduled public passenger transport services within its field of influence and to ensure that the system of integration adopted functions equitably. Sign agreements and contracts with the public passenger transport companies within its area of influence. Allocate compensatory payments made between participating companies deriving from the integrated fare system. Establish standard accounting practices among companies for entering the revenue received in return for using multimodal travel cards until the Metropolitan Transport Plan is approved. Determine the criteria to be observed in sharing out the revenue and possible subsidies received until the Metropolitan Transport Plan is approved. Promote and authorise the creation of the administrative means required to execute the measures agreed and ensure that these are suitably managed, subject to the approval of the member authorities where applicable. Arrange for those measures and service management methods that best serve the public interest to be provided by public entities and private individuals, in accordance with current legislation. Enter into any contracts or agreements with legal or physical persons alike that may be deemed necessary to the achievement of the Consortium’s objectives. Take any other measures required to achieve its objectives, in accordance with current legislation. Receive the revenue derived from taxes, public charges and any special contributions that may be levied. In order to fulfil the objectives set, and without prejudice to the powers reserved by law to the member authorities, the Consortium may take any administrative and regulatory measures that it deems appropriate: acquire, transfer, possess, claim, exchange, tax and mortgage all manner of assets; accept legacies and donations; subscribe to and fulfil contracts of any nature; arrange loans; implement and exploit works and services; take legal action and lodge appeals of any kind. All of the aforementioned measures will be taken in accordance with both these Statutes and the current legal system. President: Mrs. Marifran Carazo Villalonga, Andalusian Regional Government Minister of Public Works, Infrastructure and Territorial Planning. Vice-president: Mr. Francisco de la Torre Prados, Mayor/President of Malaga City Council. The Board of Directors is the Consortium’s senior governing body and is responsible for establishing the guidelines within which the latter operates, in accordance with the common wishes of its member entities. The Board of Directors consists of 17 members, assisted by a Secretary/Administrator, representing each of the Consortium’s member entities, distributed as follows: two representatives of the Andalusian Regional Government, including the Presidency; two representatives of Malaga City Council, including the Vice-Presidency; one representative of Malaga Provincial Council; and one representative of each of the towns belonging to the Consortium. The Executive Committee was set up within the Board of Directors in order to speed up the management process. The Executive Committee consists of 17 members, assisted by a Secretary/Administrator, representing each of the Consortium’s member entities, distributed as follows: two representatives of the Andalusian Regional Government, including the Presidency; two representatives of Malaga City Council, including the Vice-Presidency; one representative of Malaga Provincial Council; and one representative of each of the towns belonging to the Consortium. The Management is responsible for the administration of the Consortium in accordance with the guidelines established either by the Board of Directors or the Executive Committee. This function is fulfilled by a Managing Director appointed by the aforementioned Board, having first been proposed by the Presidency. The current Managing Director is Ms. Marina García Ponce. This will comprise the members listed below, who are appointed by the companies, organisations or administrations that they represent. Two representatives of consumer and user associations. A representative of the neighbours’ associations. A representative of associations for persons with reduced mobility. A representative of environmental protection associations or groups. A representative of pedestrians’ associations or groups. A representative of cyclist’s associations or groups. A representative belonging to the staff of the Malaga Area Metropolitan Transport Consortium responsible for the technical matters dealt with by this Committee. The Managing Director of the Malaga Area Metropolitan Transport Consortium or a member of the Consortium staff delegated in his/her stead, who will serve as President of the Committee. The Secretary General of the Malaga Area Metropolitan Transport Consortium or a member of the Consortium staff delegated in his/her stead, who will serve as Secretary of the Committee. Two representatives of the sector’s most widely-established trade unions. Two representatives of the sector’s leading business associations in the metropolitan area. General Secretary/Administrator: Mr. José Antonio Ríos Sanagustín. Acting Treasurer: Ms. García Ruiz.